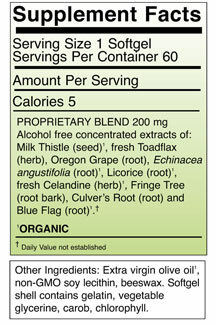 Liver Tonic™, by Herbs Etc., protects liver cells against toxins. Stimulates repair of liver cells. Protects liver and gall bladder from excessive ingestion of fatty foods, alcohol, coffee and chocolate. Useful for mild frontal headaches after fatty meals, mild constipation and simple jaundice. Suggested Use: Take one softgel with water three times a day.